Combine all ingredients in a food processor and process to a fine paste. Drop by teaspoonfuls into hot oil and fry until puffed and golden. 1/4 cup chopped cilantro or chadon beni. Combine all of the above ingredients, sprinkle with chadon beni or cilantro and serve with fritters. Boil cassava in lots of water for about 20 to 30 minutes, until very soft, drain and remove inner core. Add to drained cassava and crush cassava until creamy. 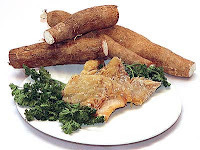 Remove inner vein from cassava; cut into two-inch lengths and place in a shallow baking dish. Heat oil in a small saucepan, add garlic and lime, add salt and pepper. Sauté for a few minutes more; do not brown garlic. cassava, covering all the cassava with the pieces. Preheat broiler and place cassava under broiler. Broil until hot and edges are browned. More delicious recipes can be found in Wendy's cookbooks: Caribbean Flavours and Modern Caribbean Cuisine. Season beef with thyme, salt and pepper. Heat oil in a saute pan, add paprika and cook until oil is coloured. Add onion, garlic and pepper. Saute for a few minutes more. Add beef and stir well. Cook for a few minutes, add tomatoes and oregano. Simmer for about 15 minutes, stirring occasionally. Taste and adjust seasonings. Add olives and turn off heat. Boil the cassava in lots of water until very soft. Drain, remove inner core and crush with a potato masher. Do not use a processor. Add butter and combine add eggs and mix well in between additions; you can use a hand mixer here. Add cornstarch, baking powder, cheese and salt to taste. Combine. Place about two tablespoons cassava onto an oiled banana leaf. Gently spread with a spoon. Place about one tablespoon of filling onto the cassava. Fold the leaf over and press down. Fold the banana leaf like a package, tie either end with a piece of string, like a piece of candy. Heat water in a large pot, place steamer insert into pot and place tamales on top. Cover and steam for 20-30 minutes. Slice off the top of the head of garlic, place on a roasting pan, drizzle with a little olive oil and wrap in foil. Roast for one hour. Cool. Squeeze garlic from the bottom and the pulp should come right out. Set aside. Boil sweet potatoes until very soft-about 40 minutes, depending on the size. Peel and crush well. Add butter, one beaten egg, milk and roasted garlic cloves. Stir to combine. Season with salt. Heat oil for frying. Roll potato into one-and-a-half-inch balls, dredge in flour, then in the other beaten egg, then in crumbs. Fry until golden. Boil cassava in lots of water for about 20-30 minutes, until very soft. Drain and remove inner core. Heat milk with butter. Add to drained cassava and crush cassava until creamy. Add gremolata and stir. Serves four to six. Place cassava into a pot. Cover with water, add a pinch of salt and boil until tender, 20-25 minutes. Drain and cool. Cut cassava into one-inch pieces, split in half and remove center fibre. In a large non-stick frying pan heat oil and all onion, peppers and garlic. Saute until fragrant. Add cassava and toss until the cassava pieces become coated with the onion and garlic mixture. Add fresh herbs and season with salt and freshly ground black pepper. Continue cooking over a medium heat, scraping the bottom of the pan to prevent sticking. Cook for ten minutes or until cassava pieces are golden in colour. Served with toast points for a delicious appetiser. Squeeze lime juice on saltfish and boil in enough fresh water until tender, about five to ten minutes. Remove and flake. Heat oil and reserve; heat milk and reserve. Place fish in a blender or food processor and puree. Add garlic and pepper. With motor running, add one-third cup of milk and oil alternately and process to a creamy consistency. Remove and set aside. Preheat oven to 350 degrees Fahrenheit. Heat butter with half-cup milk. Add to cassava. Mash to a creamy consistency; a hand-held Mixmaster works well here. Add chives and combine. Add salt and pepper to taste. Combine cassava with salt fish mixture and mix well. Place into a shallow pie plate and bake until browned on top, about 15 minutes. 1. Bring medium saucepan of water to boil. Add onions; boil 3 minutes, then drain in colander and rinse with cold water. Snip ends of each onion and slip off peels. Set aside. 2. Heat olive oil in large skillet until almost smoking; add butter. When butter melts, add mushrooms and sauté until mushrooms brown around edges. Add pearl onions; cook until lightly browned. Push vegetables to sides of pan; pour in vinegar and rum. Cook, scraping bottom of skillet with wooden spoon to release browned bits, until liquid comes to boil and reduces to a glaze. Season to taste with salt and pepper. Let cool slightly. 3. To serve, cover individual salad plates with salad greens, using 3/4-1 cup per serving. Spoon mushroom mixture over lettuce; top each serving with 1/2 ounce crumbled goat cheese.